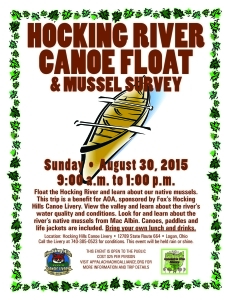 The Appalachia Ohio Alliance (AOA) is sponsoring a canoe trip on the Hocking River on Sunday, August 30th. This trip is a fundraising event for AOA held in partnership with the Fox’s Hocking Hills Canoe Livery (hockingriver.com). Livery owners Aaron and Valerie Fox will donate canoe rental proceeds to the Alliance to help support riparian corridor protection along the Hocking River. We are very grateful for their ongoing support of AOA’s river conservation mission. Float a section of the beautiful Hocking River as it flows through the picturesque Hocking valley and Hocking Hills region, past a number of properties protected by AOA which help safeguard our water quality and scenic assets. View the valley from the river and learn about the Hocking River water quality and conditions. Help look for and learn about native Hocking River mussels from Mac Albin, aquatic ecologist for Columbus Metro Parks and a local mussel expert. This is a working trip – we plan to go slow and stop frequently to search for mussels. Canoes, paddles and life jackets are included in the trip fee of $25 per person. Participants who want to use their own canoe or kayak are welcome. Single paddlers are welcome and will be paired with a partner based on experience. We will try to place at least one person with sufficient paddling experience in each canoe to navigate the natural meanders of the Hocking River environment. The trip will be held rain or shine so please dress appropriately for the weather. We will postpone the trip only in the event of severe weather or river conditions. Call AOA (614.721.2656) on Sunday morning if you need to check on conditions or the trip status. The Livery will provide transportation to the put in location and will pick us up at the take out point for transportation back to the Livery. This is trip is open to the public and no reservations are required. Spend a fun summer day on the river while helping to support AOA’s watershed conservation and education efforts! Time: Please be at the Livery ready to go by 9:00 a.m. We expect the trip to last approximately 4 hours. What to Bring: Bring your own drink, picnic lunch, sunscreen, hat, and water shoes or old sneakers. Place: Participants should meet at the Hocking Hills Canoe Livery located at 12789 State Route 664 in Logan.